^ 1.0 1.1 Ekaterinburg Arena. Sputnik International. [2018-06-22]. （原始内容存档于2018-06-23） （英语）. ^ 2018 FIFA World Cup™ to be played in 11 Host Cities. FIFA.com. 2012-09-29 [2018-01-14]. （原始内容存档于2014-02-01） （英语）. ^ 3.0 3.1 3.2 3.3 3.4 FROM THE «STADIUM CENTRAL» BEFORE «EKATERINBURG ARENA». ekaterinburg-2018.ru. [2018-06-22]. （原始内容存档于2018-06-25） （英语）. ^ 4.0 4.1 A Short History of Yekaterinburg Arena. The Moscow Times. 2018-06-01 [2018-06-25]. （原始内容存档于2018-06-25） （英语）. ^ 5.0 5.1 Ekaterinburg Arena prepares for a new life. FIFA.com. 2016-09-30 [2018-06-22]. （原始内容存档于2018-06-25） （英语）. ^ Reconstruction. ekaterinburg-2018.ru. [2018-06-26] （英语）. ^ Don't look down! The 45m high temporary stand at the Ekaterinburg Arena that stretches outside the stadium has been completed in time for World Cup. Dailymail. 2018-05-29 [2018-06-22]. （原始内容存档于2018-06-25） （英语）. ^ If You’re Afraid of Heights but Going to the World Cup, Don’t Sit Here. The New York Times. 2018-06-13 [2018-06-22]. （原始内容存档于2018-06-22） （英语）. 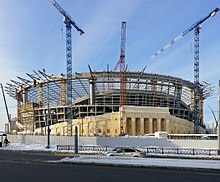 ^ 9.0 9.1 Ekaterinburg Arena construction completed. welcome2018.com. 2017-12-29 [2018-06-23]. （原始内容存档于2018-06-23） （英语）. ^ Yekaterinburg Arena 95% Ready for FIFA World Cup - Russian Deputy Prime Minister. Sputnik International. 2018-04-03 [2018-06-22]. （原始内容存档于2018-06-23） （英语）. ^ Russia 2018: Yekaterinburg ready for fans from around the world – StadiumDB.com. stadiumdb.com. 2018-04-16 [2018-06-23]. （原始内容存档于2018-06-23） （英语）. ^ First match at Ekaterinburg Arena to be held on April 1. welcome2018.com. 2018-01-11 [2018-06-23]. （原始内容存档于2018-06-25） （英语）. ^ Ekaterinburg: Ekaterinburg Arena. ITV. 2017-11-30 [2018-06-22]. （原始内容存档于2018-06-22） （英语）. ^ Yekaterinburg: Thousand tons released above the stands – StadiumDB.com. stadiumdb.com. 2016-12-16 [2018-06-23]. （原始内容存档于2018-06-23） （英语）. ^ Match report – Group A – Egypt - Uruguay (PDF). FIFA.com. 2018-06-15 [2018-06-15]. （原始内容存档 (PDF)于2018-06-24） （英语）. ^ Match report – Group C – France - Peru (PDF). FIFA.com. 2018-06-21 [2018-06-21]. （原始内容存档 (PDF)于2018-06-24） （英语）. ^ Match report – Group H – Japan - Senegal (PDF). FIFA.com. 2018-06-24 [2018-06-24]. （原始内容存档 (PDF)于2018-06-25） （英语）. ^ Match report – Group F – Mexico - Sweden (PDF). FIFA.com. 2018-06-27 [2018-06-27] （英语）.